PayPal In order to offer our customer reasonable prices, Esiamcenter relies upon Paypal for money transactions. Through PayPal, we accept Visa, MasterCard, American Express and Discover, and electronic checks. In case of over 10 or 20 kg parcel, we will find other couriers such as UPS, DHL and FEDEX. 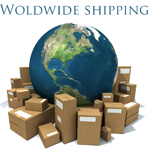 And we will send you an estimate shipping rates which can save your shipping cost as much as possible. Item will be shipped within 24 business hours (excluding holidays and weekends) after your payment has been cleared and confirmed. We will inform you about the delivery status when your item has been sent. All international orders are subject to duties, taxes and fees as determined by their local government. Since each country is different, Esiamcenter is not able to take responsibility in paying those duties. All duties, taxes and fees must be paid by the customer. According to different requirements in different countries, it would be better to ensure with your government customs office and check out information about custom clearance, duties and taxes. Try to find out what the taxes are and how much you can buy without paying taxes.